Modern behavior and an ability to think and have knowledge are two sides of the same coin. 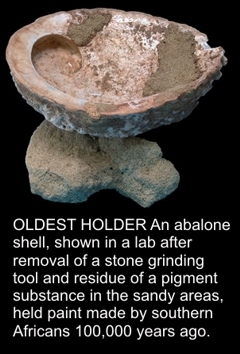 Recent discoveries show this goes way back, even before Adam and Eve ;-). Our existential difficulties are a consequence of the unique ability we have for thinking and knowing… and for thinking we know. As chapter 71 says, Realizing I don’t’ know is better; not knowing this knowing is disease (1). How does this disease influence serious issues? Clearly, the gravest existential issue that ancient man’s thinking confronted was death. Once symbolic thought evolved, humanity stepped out of the spontaneous conscious experience other animals ‘enjoy’. Once having an objective sense of past and future, we could worry about death and other virtual losses beyond a moment to-moment experience. For worrywarts, that could be all the time. Simply put, worry = fear + thought (when it dwells in the pseudo realities of past and future). Take any issue we stress over such as racism, ecology, crime, drug use, war, divorce, and (_you name it_ ). They all relate to death, or something we fear to lose. In other words, they threaten something we hold dearly. Each issue has underlying natural causes; thinking we know only fuels the issue’s fire. The natural cause is the molehill; thinking we know makes the mountain. For example, people have viewed death as God’s punishment of Adam and Eve for their original sin. Nonsense! The worries we have are a natural consequence of memory—knowledge. Okay, I guess you could say the ‘knowledge’ of death can be a punishment, or at chapter 71 says, a “disease”. Truth be told, the objects of our worries are symptoms and not the true problem, yet we seem to keep trying to fix the symptoms without looking very deeply into the natural causes. One reason may be that it is too disturbing to look that deep. It is certainly more comfortable to regard the symptom as the problem and rashly jump to a solution. Never mind that the ‘solution’ fails, and the problem soon returns, begging for another promising ‘solution’. Masking or attacking symptoms never cures a disease. Nonetheless, this is completely natural. This response is instinctive; we are just innocently reacting as we would to any immediate physical problem we would encounter in the wild. It may help to consider a practical example of this problem vs. solution issue. If you had a thorn in your foot, you’d pull it out… problem solved. The symptom and problem are nearly one and the same; connected concurrently. The existential problems we experience however, don’t resolve that easily. The seeds of these problems are sown from throughout childhood. The initial seed is the innate capacity we inherit at birth that makes symbolic thought possible. We’ve been dealing with the existential difficulties that thought causes for at least 150,000 years. Evidence of this mounts as this excerpt from the Science News article, Going Coastal: Sea cave yields ancient signs of modern behavior shows. At Pinnacle Point on South Africa’s southern coast, a cave perched above the sea has provided scientists with evidence of a set of surprisingly complex behaviors practiced by Stone Age people about 164,000 years ago, near the evolutionary dawn of Homo sapiens. Our species emerged an estimated 200,000 years ago. The team found three critical clues in the cave that point to modern-human behavior: the remains of mussels and other shellfish, 57 pieces of reddish pigment probably used for body coloring or other symbolic acts, and more than 1,800 stone implements, including small, expertly crafted blades. Ancient Africans took up coastal living between 195,000 and 130,000 years ago, when a relatively cold, dry climate inland reduced the number of edible plants and animals. Shellfish harvested from exposed, rocky shores and from tidal pools offered a stable food source that allowed populations to grow and become less nomadic. From a symptoms point of view, the “reddish pigment probably used for body coloring or other symbolic acts” tells me that people way back then were dealing with an existential problem. They were reacting to a kind of ‘mind – body’ separation that we deal with to this day. The symbolic acts were their attempts to regain or maintain psychological equilibrium. In addition, “a stable food source that allowed populations to grow and become less nomadic” offered these particular people two circumstances that augmented any existential issues: (1) more free time to dwell on ‘self’ and (2) opportunities to experience some of the problems that arise for humans amassed into large populations (i.e., civilization). We did not evolve to live in such large impersonal social groups, but rather as small and intimate tribal communities of a few dozen souls at most. As a hunter-gatherer species, neither did we evolve to settle down and amass lots of stuff on which to cleave. This only exacerbates our existential problem. As Buddha pointed out, “The illusion of self originates and manifests itself in a cleaving to things“. The underlying issues of cognitive ‘overdevelopment’ and ‘population overdevelopment’ are certainly root causes of the problems we face today. Clearly, we are helpless to do anything about either one(2) However, don’t you feel it would be more helpful to actually perceive the deeper underlying causes of our problems? At least then, we might find ways to manage them more effectively. (1) The Book of Genesis parallels the overall ‘knowledge problem’ spoken to in the Tao Te Ching. I suppose this is the only place where West and East truly meet eye to eye. (2) I suspect that we are innately loath to consider any problem whose causes we feel helpless to eliminate. We naturally take the path of least resistance, turn a blind eye to reality, and opt for imagined scenarios that promise to solve the problem… at least theoretically. Doesn’t that pretty well describe religion and politics across the board?